Strategy is key in this new twist on hopscotch! Improve balance and strengthen legs. Includes 9 charcoal interlocking EVA foam tiles. 20 hexagon dry-erase adhesive back stickers. Plus "Things to Know" rules and activity guide! Strategy is key in this engaging new twist on traditional hopscotch! 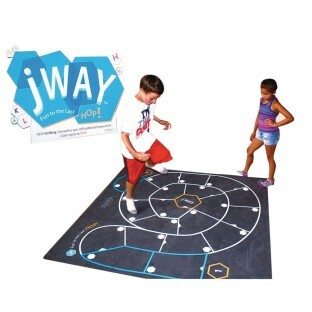 jWAY targeted health areas include improved balance, coordination, core leg and foot muscle strengthening. 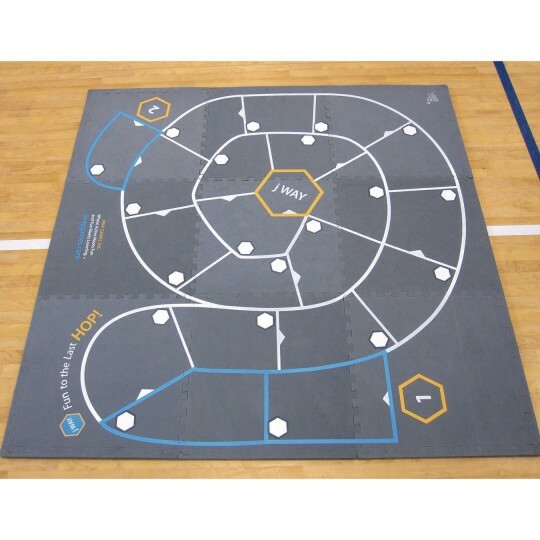 Includes 9 charcoal Interlocking EVA foam tiles with graphics (each 24" x 24" x 3/8"), 20 hexagon dry-erase adhesive back stickers to adhere to the board, 1 "Things to Know" rules/guidelines insert and 1 Suggested Activity Guide insert referencing the National P.E. 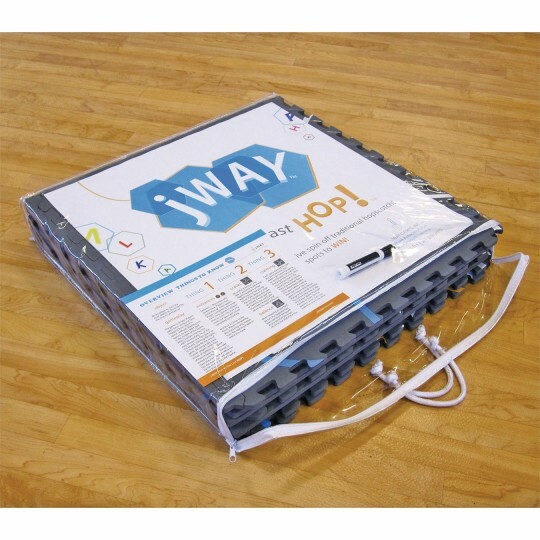 Standards with alternative ways to play jWAY for early learners and special needs users. jWAY is that game that becomes a staple in your program. Truly since the moment we opened the game and explained it to the kids it was an immediate hit. We are going to order another at the end of this year for the following. We currently have one and it is utilized the entire after school program. jWAY is good for anywhere upwards 10-12 players and as small as 2 players. Each game lasts about 45 minutes and kids can jump in and out of the game-play whenever they want. I highly recommend this game for anyone looking for a game that is fun active and allows instructors to expend less energy running around entertaining since the game does that on it own. Great choice - thank you SS! This game has allowed me to include my entire class something I have not been able to do with an activity before. I have a phys. ed class that includes children 5 years old to ages 12 all in the same class! So to have a game that each kids can play is engaged and entertained in together at the same time is RARE! jWAY is this game. Highly recommend to teachers - thank YOU SS! WOW! Quality at it's BEST! This is fabulous! I love having a hopscotch mat that provides a unique pattern for children and it is challenging as well. My students love it and look forward to using it as a station in our physical education class. The durability and craftsmanship are superb. 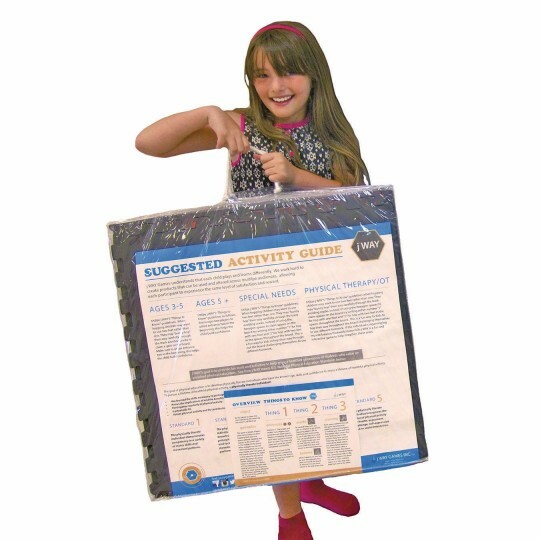 I'm happy I finally found a product that is active fun and loved by all. This is the first game that I've introduced to all of our kids at our Afterschool site and every kid- at every ability and age boy and girl has loved and been engaged with. 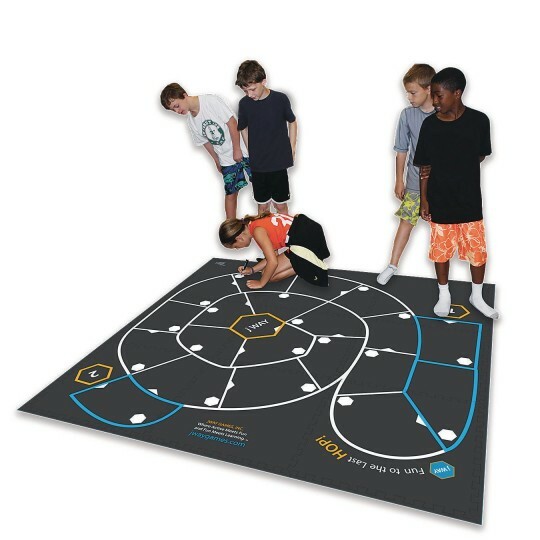 It's fun gets kids involved actively by hopping throughout the board and also makes the kids think strategically when picking their spots. Each game can last anywhere between 45 minutes to an hour. If we let the kids I think they would just choose to play this all day. Definitely recommend it! Never seen kids so excited about a game. I am a Mother in the Buffalo area who recently bought this product for my son for Christmas. He is 9 and absolutely loved jWAY the minute he played it. He came home and said I just have to have it Mom. It was tops on his xmas list! Happy to find a product for my son that is active and he loves.